While driving on Pierce Point Road through the northern end of Point Reyes National Seashore, I can't drive by the Abbott's Lagoon parking lot without taking a swing through to look for quail. There always seem to be some around, and even though I was planning to start my day looking for elk near the Pierce Point Ranch on my most recent trip, I swung through the lot to have a peek as I passed. Much to my delight, there was a large male sitting on a fence right in the parking lot. Unfortunately, by the time I got my camera and tripod out of the car, he had wandered into the bushes with his female, but it didn't take long to locate others. In fact, this was the highest density of quail I've ever seen in the park. They seemed to be everywhere along the trail to Abbott's Lagoon, with couples wandering through the pastures and males occupying high vantage points all throughout the coastal scrub. 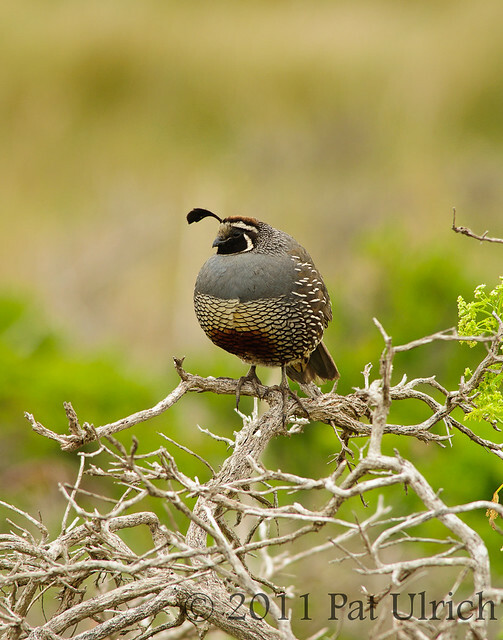 Some chose nice clean fenceposts, and others selected luxurious green bushes, but this particular quail selected the old gnarled branches of an coyote bush long past its prime. 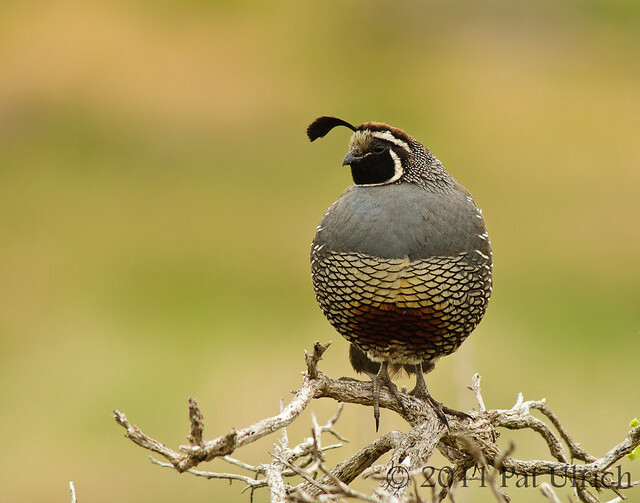 View more in my Quail Gallery. The bird is pretty unique... sharp, nice bokeh, awesome! Good composition, colors and BG Pat. Absolutely exquisite! Terrific detail and bokeh. Love the gnarly perch. This is not a bird we see in the Midwest. A pleasure to view it here! Thanks, Ben! Quail certainly are unique birds with that headbob and varied patterns. Thanks, Julie! I get a lot of looks at quail on fenceposts, so I was excited to see one on a much more interesting perch. All your photography is exceptional! The Quail shots are magnificent! Thanks for stopping by my blog and your comment on my pelicans! Youare such a great photographer! These are stunning shots. Absolutely gorgeous shots! Love the juxtaposition of that soft round bird on those craggy dead branches! this bird is a piece of art. :) And the setting of the shot is so suitable to the bird. Could not be better I think. Thanks for your compliments, Barb! Thanks for your kind words, JM! Thanks, Hilke! I was definitely excited to see a quail on such an interesting perch. Far more interseting than the fence posts they are normally on! Such a beautiful bird, and that knarly branch adds a special touch to the photograph.